and makes the Order in Appendix C.
THE NORTHWEST QUARTER OF SECTION SEVENTEEN (17), TOWNSHIP SEVENTY-ONE (71), RANGE FIVE (5), WEST OF THE SIXTH (6) MERIDIAN. THE NORTHEAST QUARTER OF SECTION EIGHTEEN (18), TOWNSHIP SEVENTY-ONE (71), RANGE FIVE (5), WEST OF THE SIXTH (6) MERIDIAN. 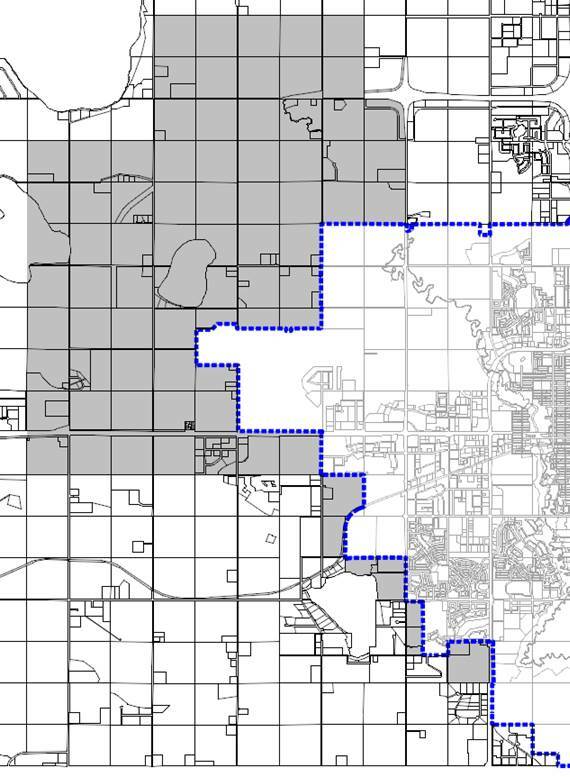 ALL THAT PORTION OF SECTION NINETEEN (19), TOWNSHIP SEVENTY-ONE (71), RANGE FIVE (5), WEST OF THE SIXTH (6) MERIDIAN NOT WITHIN THE CITY OF GRANDE PRAIRIE. THE WEST HALF OF SECTION TWENTY (20), TOWNSHIP SEVENTY-ONE (71), RANGE FIVE (5), WEST OF THE SIXTH (6) MERIDIAN. ALL THAT PORTION OF THE NORTH HALF OF SECTION THIRTY-TWO (32), TOWNSHIP SEVENTY-ONE (71), RANGE FIVE (5), WEST OF THE SIXTH (6) MERIDIAN NOT WITHIN THE CITY OF GRANDE PRAIRIE. THE NORTH HALF OF SECTION THIRTY-THREE (33), TOWNSHIP SEVENTY-ONE (71), RANGE FIVE (5), WEST OF THE SIXTH (6) MERIDIAN. THE NORTHWEST QUARTER OF SECTION THIRTY-FOUR (34), TOWNSHIP SEVENTY-ONE (71), RANGE FIVE (5), WEST OF THE SIXTH (6) MERIDIAN. THE WEST HALF OF SECTION THREE (3), TOWNSHIP SEVENTY-TWO (72), RANGE FIVE (5), WEST OF THE SIXTH (6) MERIDIAN. SECTION FOUR (4), TOWNSHIP SEVENTY-TWO (72), RANGE FIVE (5), WEST OF THE SIXTH (6) MERIDIAN. SECTION FIVE (5), TOWNSHIP SEVENTY-TWO (72), RANGE FIVE (5), WEST OF THE SIXTH (6) MERIDIAN. THE NORTH HALF OF SECTION SIX (6), TOWNSHIP SEVENTY-TWO (72), RANGE FIVE (5), WEST OF THE SIXTH (6) MERIDIAN INCLUDING THOSE LANDS ADJACENT TO THE NORTH-SOUTH ROAD ALLOWANCE ON THE WEST SIDE OF SAID HALF SECTION LYING NORTH OF THE PROJECTION EAST OF THE SOUTHERN BOUNDARY OF LOT 12, BLOCK 18, PLAN 0220873 TO THE WEST BOUNDARY OF SAID NORTH- SOUTH ROAD ALLOWANCE AND EAST OF THE EAST BO0UNDARY OF LOT 12, BLOCK 18, PLAN 0220873 AND EAST OF THE PROJECTION NORTH OF THE EAST BOUNDARY OF LOT 12, BLOCK 18, PLAN 0220873 TO THE NORTH BOUNDARY OF SAID HALF SECTION AND NOT INCLUDING LOT 6PUL (PUBLIC UTILITY LOT), BLOCK 18, PLAN 0024970. ALL THAT PORTION OF THE SOUTHWEST QUARTER OF SECTION ELEVEN (11), TOWNSHIP SEVENTY-ONE (71), RANGE SIX (6), WEST OF THE SIXTH (6) MERIDIAN NOT WITHIN THE CITY OF GRANDE PRAIRIE. ALL THAT PORTION OF THE SOUTHEAST QUARTER OF SECTION TEN (10), TOWNSHIP SEVENTY-ONE (71), RANGE SIX (6), WEST OF THE SIXTH (6) MERIDIAN EXCLUDING THAT PORTION OF THE NORTH-SOUTH ROAD ALLOWANCE ADJACENT TO THE WEST SIDE OF SAID QUARTER SECTION LYING SOUTH OF THE PROJECTION EAST OF THE SOUTH BOUNDARY OF LOT 1PLU (PUBLIC UTILITY LOT), BLOCK 4, PLAN 1421831. ALL THAT PORTION OF THE SOUTHWEST QUARTER OF SECTION TEN (10), TOWNSHIP SEVENTY-ONE (71), RANGE SIX (6), WEST OF THE SIXTH (6) MERIDIAN NOT WITHIN THE CITY OF GRANDE PRAIRIE LYING NORTH OF THE SOUTH BOUNDARY OF THE EAST-WEST ROAD ALLOWANCE ADJACENT TO THE SOUTH SIDE OF LOT A, PLAN 6350NY AND EXCLUDING THAT PORTION OF THE SAID EAST- WEST ROAD ALLOWANCE LYING EAST OF THE PROJECTION SOUTH OF THE EAST BOUNDARY OF LOT A, PLAN 6350NY AND EXCLUDING THAT PORTION OF THE NORTH-SOUTH ROAD ALLOWANCE ADJACENT TO THE WEST SIDE OF SAID QUARTER SECTION LYING SOUTH OF THE PROJECTION WEST OF THE NORTH BOUNDARY OF LOT A, PLAN 8822860. ALL THAT PORTION OF THE NORTHWEST QUARTER OF SECTION TEN (10), TOWNSHIP SEVENTY-ONE (71), RANGE SIX (6), WEST OF THE SIXTH (6) MERIDIAN NOT WITHIN THE CITY OF GRANDE PRAIRIE INCLUDING THOSE LANDS ADJACENT TO THE NORTH-SOUTH ROAD ALLOWANCE ON THE WEST SIDE OF SAID QUARTER SECTION LYING EAST OF THE EAST BOUNDARY OF LOT 7, BLOCK 1, PLAN 0620364 AND THE PROJECTION NORTH OF THE EAST BOUNDARY OF SAID LOT TO THE NORTH BOUNDARY OF PLAN 0620634 AND INCLUDING ALL THOSE LANDS LYING EAST OF THE EAST BOUNDARY PLAN 9825214 AND INCLUDING THOSE LANDS LYING EAST OF THE PROJECTION NORTH OF THE EAST BOUNDARY OF LOT 10MR, PLAN 9825214. ALL THAT PORTION OF THE SOUTHEAST QUARTER OF SECTION SIXTEEN (16), TOWNSHIP SEVENTY-ONE (71), RANGE SIX (6), WEST OF THE SIXTH (6) MERIDIAN LYING NORTH AND EAST OF THE BED AND SHORE OF FLYINGSHOT LAKE AND INCLUDING THOSE LANDS SOUTH OF SAID QUARTER SECTION LYING NORTH OF THE NORTH BOUNDARY OF PLAN 8220326 AND NORTH OF THE NORTH BOUNDARY OF PLAN 9825214 AND NORTH OF THE PROJECTION EAST OF THE NORTH BOUNDARY OF PLAN 9825214 TO THE NORTH-SOUTH ROAD ALLOWANCE ADJACENT TO THE WEST SIDE OF THE NORTH WEST QUARTER OF SECTION TEN (10), TOWNSHIP SEVENTY-ONE (71), RANGE SIX (6), WEST OF THE FOURTH MERIDIAN AND EAST OF THE BED AND SHORE OF FLYING SHOT LAKE. FLYING SHOT LAKE SETTLEMENT ALL THAT PORTION OF LOT 4 WHICH LIES TO THE SOUTH OF THE SOUTHERN LIMIT OF THE ROAD ALLOWANCE CROSSING THE SAID LOT, AS SHOWN ON A PLAN OF SURVEY OF THE SAID SETTLEMENT DATED 11 NOVEMBER 1908. ALL THAT PORTION OF THE NORTHWEST QUARTER OF SECTION SIXTEEN (16), TOWNSHIP SEVENTY-ONE (71), RANGE SIX (6), WEST OF THE SIXTH (6) MERIDIAN NOT WITHIN THE CITY OF GRANDE PRAIRIE. 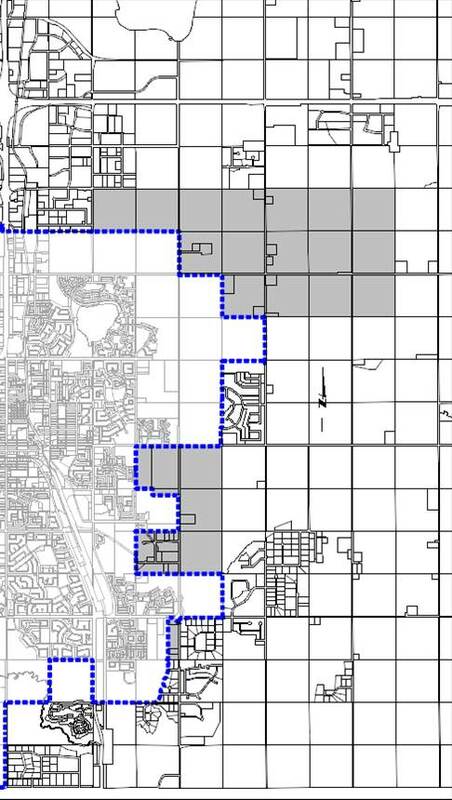 ALL THAT PORTION OF THE SOUTHWEST QUARTER OF SECTION TWENTY-ONE (21), TOWNSHIP SEVENTY-ONE (71), RANGE SIX (6), WEST OF THE SIXTH (6) MERIDIAN NOT WITHIN THE CITY OF GRANDE PRAIRIE AND INCLUDING THE LAND LYING ADJACENT TO THE EAST OF THE EAST BOUNDARY OF LOTS 3, 4, 5, 6, AND 7 OF BLOCK 3 PLAN 0727689. 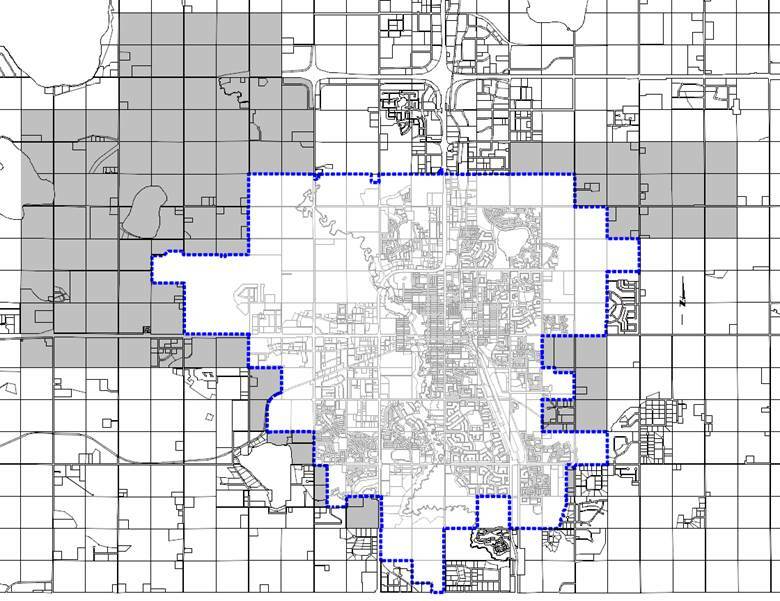 ALL THAT PORTION OF THE NORTHWEST QUARTER OF SECTION TWENTY-ONE (21), TOWNSHIP SEVENTY-ONE (71), RANGE SIX (6), WEST OF THE SIXTH (6) MERIDIAN NOT WITHIN THE CITY OF GRANDE PRAIRIE. THE NORTH HALF OF SECTION TWENTY (20), TOWNSHIP SEVENTY-ONE (71), RANGE SIX (6), WEST OF THE SIXTH (6) MERIDIAN. THE NORTH HALF OF SECTION NINETEEN (19), TOWNSHIP SEVENTY-ONE (71), RANGE SIX (6), WEST OF THE SIXTH (6) MERIDIAN. THE NORTH HALF OF SECTION TWENTY-FOUR (24), TOWNSHIP SEVENTY-ONE (71), RANGE SEVEN (7), WEST OF THE SIXTH (6) MERIDIAN. THE NORTHEAST QUARTER OF SECTION TWENTY-THREE (23), TOWNSHIP SEVENTY-ONE (71), RANGE SEVEN (7), WEST OF THE SIXTH (6) MERIDIAN. THE EAST HALF OF SECTION TWENTY-SIX (26), TOWNSHIP SEVENTY-ONE (71), RANGE SEVEN (7), WEST OF THE SIXTH (6) MERIDIAN. SECTION TWENTY-FIVE (25), TOWNSHIP SEVENTY-ONE (71), RANGE SEVEN (7), WEST OF THE SIXTH (6) MERIDIAN. ALL THAT PORTION OF SECTION THIRTY (30), TOWNSHIP SEVENTY-ONE (71), RANGE SIX (6), WEST OF THE SIXTH (6) MERIDIAN NOT WITHIN THE CITY OF GRANDE PRAIRIE. ALL THAT PORTION OF SECTION THIRTY-TWO (32), TOWNSHIP SEVENTY-ONE (71), RANGE SIX (6), WEST OF THE SIXTH (6), MERIDIAN NOT WITHIN THE CITY OF GRANDE PRAIRIE. ALL THAT PORTION OF SECTION THIRTY-ONE (31), TOWNSHIP SEVENTY-ONE (71), RANGE SIX (6), WEST OF THE SIXTH (6) MERIDIAN NOT WITHIN THE CITY OF GRANDE PRAIRIE. SECTION THIRTY-SIX (36), TOWNSHIP SEVENTY-ONE (71), RANGE SEVEN (7), WEST OF THE SIXTH (6) MERIDIAN. THE EAST HALF OF SECTION THIRTY-FIVE (35), TOWNSHIP SEVENTY-ONE (71), RANGE SEVEN (7), WEST OF THE SIXTH (6) MERIDIAN. THE EAST HALF OF SECTION TWO (2), TOWNSHIP SEVENTY-TWO (72), RANGE SEVEN (7), WEST OF THE SIXTH (6) MERIDIAN. SECTION ONE (1), TOWNSHIP SEVENTY-TWO (72), RANGE SEVEN (7), WEST OF THE SIXTH (6) MERIDIAN. SECTION SIX (6), TOWNSHIP SEVENTY-TWO (72), RANGE SIX (6), WEST OF THE SIXTH (6) MERIDIAN. SECTION FIVE (5), TOWNSHIP SEVENTY-TWO (72), RANGE SIX (6), WEST OF THE SIXTH (6) MERIDIAN. ALL THAT PORTION OF THE NORTH HALF OF SECTION FOUR (4), TOWNSHIP SEVENTY-TWO (72), RANGE SIX (6), WEST OF THE SIXTH (6) MERIDIAN AND EXCLUDING THAT LAND LYING EAST OF THE EAST BOUNDARY OF BLOCK 1, PLAN 8421382 AND THAT LAND LYING EAST OF THE PROJECTION SOUTH OF THE EAST BOUNDARY OF LOT 1, PLAN 8421382. ALL THAT PORTION OF THE SOUTH HALF OF SECTION NINE (9), TOWNSHIP SEVENTY-TWO (72), RANGE SIX (6), WEST OF THE SIXTH (6) MERIDIAN EXCLUDING ROAD PLAN 992 3745. COMMENCING FROM THE NORTHEAST CORNER OF SAID HALF SECTION AND MOVING WESTWARD ALONG THE NORTH BOUNDARY OF SAID HALF SECTION TO THE FIRST POINT WHERE THE BOUNDARY OF SAID ROAD PLAN INTERSECTS THE NORTH BOUNDARY OF SAID HALF SECTION THEN SOUTH EASTERLY ALONG THE BOUNDARY OF SAID ROAD PLAN TO THE MOST SOUTH-EASTERLY POINT OF SAID ROAD PLAN BOUNDARY THEN SOUTH ALONG A LINE PROJECTED TO THE POINT WHERE THE WEST BOUNDARY OF PLAN 992 3725 CONTACTS THE SOUTH BOUNDARY OF SAID HALF SECTION THEN EAST ALONG THE SOUTH BOUNDARY OF SAID HALF SECTION TO THE EAST BOUNDARY OF SAID HALF SECTION THEN NORTH ALONG THE EAST BOUNDARY OF SAID HALF SECTION TO THE NORTHEASTERN CORNER OF SAID HALF SECTION. SECTION EIGHT (8), TOWNSHIP SEVENTY-TWO (72), RANGE SIX (6), WEST OF THE SIXTH (6) MERIDIAN. SECTION SEVEN (7), TOWNSHIP SEVENTY-TWO (72), RANGE SIX (6), WEST OF THE SIXTH (6) MERIDIAN. THE SOUTH HALF OF SECTION TWELVE (12), TOWNSHIP SEVENTY-TWO (72), RANGE SEVEN (7), WEST OF THE SIXTH (6) MERIDIAN. THE SOUTHEAST QUARTER OF SECTION ELEVEN (11), TOWNSHIP SEVENTY-TWO (72), RANGE SEVEN (7), WEST OF THE SIXTH (6) MERIDIAN. SECTION EIGHTEEN (18), TOWNSHIP SEVENTY-TWO (72), RANGE SIX (6), WEST OF THE SIXTH (6) MERIDIAN AND INCLUDING THE LAND ADJACENT TO THE WEST SIDE OF SAID QUARTER SECTION LYING EAST OF THE WEST BOUNDARY OF ROAD PLAN 9624501 AND INCLUDING THAT PORTION OF THE EAST-WEST ROAD ALLOWANCE ADJACENT TO THE SOUTH OF SAID SECTION LYING EAST OF THE PROJECTION SOUTH OF WEST BOUNDARY OF PLAN 962 4501. SECTION SEVENTEEN (17), TOWNSHIP SEVENTY-TWO (72), RANGE SIX (6), WEST OF THE SIXTH (6) MERIDIAN. THE WEST HALF OF SECTION SIXTEEN (16), TOWNSHIP SEVENTY-TWO (72), RANGE SIX (6), WEST OF THE SIXTH (6) MERIDIAN. (iii) the parcel of land becomes a new parcel of land created as a result of subdivision, or separation of title either by registered plan of subdivision or by instrument or any other method that occurs at the request of, or on behalf of, the landowner, except where the subdivision of one parcel of land (with or without a farmstead) is from an un-subdivided quarter section in use for farming purposes. 2040 the previous year's municipal tax rate established by The County of Grande Prairie No. 1 plus 100% of the difference in municipal tax rates between the municipalities. (4) Subsections (1) and (2) cease to apply to a parcel of land and any assessable improvements to it in the taxation year immediately following the taxation year in which a triggering event occurs with respect to the parcel of land. (5) After subsections (1) and (2) cease to apply to a parcel of land, the parcel of land and any assessable improvements to it must be assessed and taxed in the same manner and at the same rate as other property of the same assessment class in the City of Grande Prairie is assessed and taxed. 2050 the previous year's municipal tax rate established by The County of Grande Prairie No. 1 plus 100% of the difference in municipal tax rates between the municipalities. (b) the farm property ceases to be exempt from taxation under the Municipal Government Act or any successor Act. (5) After subsections (1) and (2) cease to apply to farm property, the farm property and any assessable improvements to it must be assessed and taxed in the same manner and at the same rate as other property of the same assessment class in the City of Grande Prairie is assessed and taxed. (e) $294, 319.00 on or before December 31, 2020.